Rabbi of Lublin, Poland, in the latter half of the sixteenth century. Gaining the favor of Count Jenchinsky, the starost of Lublin, he secured in 1556 a very considerable parcel of land which adjoined his house, and which had formerly been covered by a mill-pond. Having filled in this uneven area, May made it available for the growth of the overcrowded Jewish quarter of Lublin. In time most of the land became covered with Jewish houses; but May reserved a portion of it, which he presented to the community for the establishment of a yeshibah. In this way he was largely instrumental in founding the first high-grade rabbinical school in Poland. 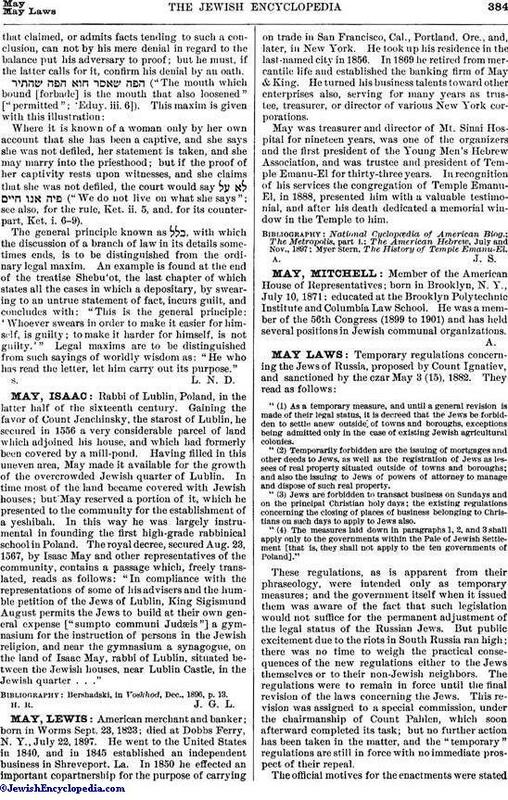 The royal decree, secured Aug. 23, 1567, by Isaac May and other representatives of the community, contains a passage which, freely translated, reads as follows: "In compliance with the representations of some of his advisers and the humble petition of the Jews of Lublin, King Sigismund August permits the Jews to build at their own general expense ["sumpto communi Judæis"] a gymnasium for the instruction of persons in the Jewish religion, and near the gymnasium a synagogue, on the land of Isaac May, rabbi of Lublin, situated between the Jewish houses, near Lublin Castle, in the Jewish quarter . . ."
Bershadski, in Voskhod, Dec., 1896, p. 13.